Spread about 1 tablespoon of the dip evenly over each rectangle to within 1/4 inch of edges. 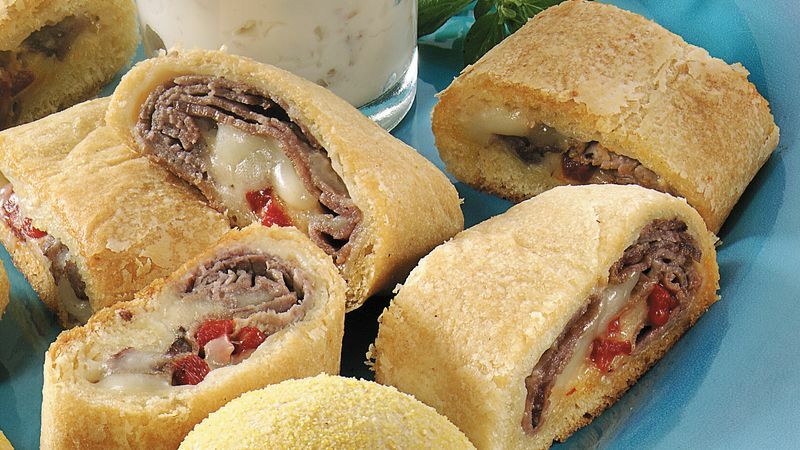 Top evenly with beef, roasted peppers and cheese. Trim beef if necessary. Starting with long side, roll up each rectangle; pinch edges to seal. Place rolls on ungreased cookie sheet. Bake 14 to 20 minutes or until golden brown. Cool 3 minutes; remove from cookie sheet. Cut each roll into 6 slices. Serve warm with remaining 1/4 cup dip.